Elephants and Rhinoceroses frequently encounter chronic non-healing infected abscesses and cutaneous wounds that become resistant to traditional antibiotics and treatments. Over time, these wounds can have serious long-term consequences such as systemic infections and impaired mobility. Recognizing the difficulty in treating these types of wounds, the FDA’s Center for Veterinary Medicine has recently allowed Synedgen to market Synoplex®, Synedgen’s veterinary wound rinse product, as an FDA Indexed Product to treat infected, chronic and non-infected wounds in elephants and rhinoceroses. Synoplex® is intended for the treatment of chronic foot disease (cracked nails, abscesses, lesions, ulcers, fissures) and chronic non-healing dermal or subdermal wounds such as abscesses and pressure sores caused by chronic inflammation or bacterial species. Synoplex® is also intended for use as a regular treatment for non-infected wounds at a lower dose. 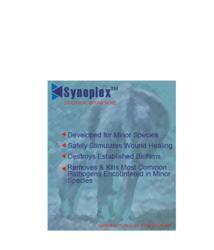 Data have shown that Synoplex® breaks up established biofilms, flushes the bacteria from the wounds, and inhibits the formation of biofilms, providing a safe, prophylactic and therapeutic treatment for both chronic and acute infections associated with dermal wounds and foot disease in elephants and rhinoceroses. In addition, Synoplex® has been shown to encourage wound healing, unlike other topical disinfectants that are damaging to tissue. Currently, wounds in elephants and rhinoceroses are treated with systemic or topical antibiotics as well as topical disinfectants, such as chlorhexidine or Betadine. These disinfectants are great at reducing bacteria, but they are very harsh on the wound and can inhibit healing. The cost of systemic antibiotics in these large animal species can be cost prohibitive and disrupt their gut flora. Synoplex® can be used for Gram-positive or Gram negative bacterial infections, as well as in non-infected wounds. Synedgen Inc. is an innovative biopharmaceutical company focused on developing novel therapies and products through its proprietary biomaterials technology platform. This platform technology provides the foundation for preventing bacterial growth and disruption of biofilms in human and environmental applications. Product development is targeted to specifically address unmet needs for therapies that treat and prevent infections, primarily from bacteria that have developed resistance to traditional antibiotics.